Although Johnny’s is the main type of music that I like here in Japan, over the past few years of living here I have discovered a handful of female singers that have caught my attention. Some of these singers aren’t extremely popular as compared to big artists like Namie Amuro and Koda Kumi or idol groups like AKB48, but people will definitely know their name if you mention them. That is why I describe them as “Underrated” Female singers. In this post, I will introduce three Female singers that I feel are underrated and are also a good bridge into Female singers in Japan. Most people will know her as a “Talento”, or a TV personality in Japan, but surprisingly she also has a singing career under the name ベッキー♪♯. As most people are, I was first introduced to her through the variety show ItteQ and some dramas where she made an appearance. She is half Japanese, half English and began her singing debut in 2009 with her single “Kokoro Komete” 「心こめて」. She is the oldest out of the artists in this post at 30 years old, but her personality is so vibrant that she still seems in her 20’s! For her music, she has a very distinct pronunciation when she sings by emphasizing her vowels and I was very attracted to that when I first heard her debut single. She has a very “pure” sounding voice to me and her more upbeat songs are very fun and vibrant, really showcasing her personality that I see on Television. The songs I would recommend from her are her debut single 「心こめて」(Kokomo Komete) as well 「ヤルキスイッチ」(Yaruki Switch) and 「風のしらべ」(Kaze no Shirabe). She has a YouTube channel with her music videos on it, so head there from the music video for 「心こめて」(Kokoro Komete) linked below! Ayaka is a Japanese singer from Osaka and made her debut in 2006 with “I Believe” for a Japanese drama. Her debut year was a huge success and her first album “First Message” topped the Oricon charts and became the highest selling debut album for a female singer in 7 years. She is married to famous actor Mizushima Hiro since 2009 and also in 2009 she announced a hiatus due to a diagnosis of Graves Disease. She was on hiatus until 2012 and made a comeback with her album “The beginning”. I was introduced to Ayaka through a Johnny’s friend who invited me to her concert in 2013. I had heard some of her songs before, but I didn’t realize that it was Ayaka that had sung them. This year, I had the opportunity to see her live again, this time for an acoustic live. This time I really felt the power of her voice and her vocal range is amazing! She can be powerful, as well as soft in the same song and her voice is so clear. Ayaka mostly sings ballads from what i’ve heard from her. Some of my favorites songs from her are new single「にじいろ」(Nijiiro), as well as “Beautiful”, which was the theme song for the drama 「シェアハウスの恋人」(Share House no Koibito), and 「はじまりのとき」(Hajimari no Toki). She also has a YouTube channel with some of her music videos on there, so please check out “Nijiiro” below! 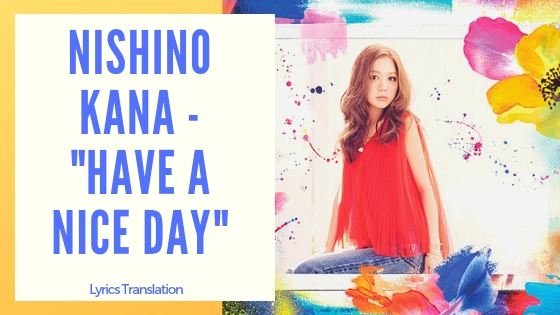 Nishino Kana debuted in 2008 with “I”. She was originally signed to SME records in 2006 when she won a contest called the “Miss Phoenix Auditions”. One of her biggest hits was “Best Friend” in 2010, as well as well as 「会いたくて」 (Aitakute). She has been nominated and won many MTV Music Video awards and Japan Record awards. She also appears in many fashion magazines for her specific style, which is not quite “Gyaru” , but a popular type of style with college age girls and women in their early 20’s. Compared to the other two artists, she has a bit more of a “Pop” like sound to her music, making it more mainstream than the other two artists. Though she has more of a pop sound, she still writes a lot of her music. Out of all of these artists today, Nishino Kana is probably my favorite, as I like the majority of the music that she releases. I also find her lyrics very relatable to the average person, especially women in their late teens and 20’s. My favorite songs by her are are “ SAKURA, I love you?” “We Don’t Stop”, and “Be Strong”, as well as “Best Friend”. She also has a YouTube channel, so please check out “We Don’t Stop” below! Had you heard of these artists before? If so, who do you like? If you didn’t know them before, are there any of them that you became interested in? Please feel free to let me know in the comments below! As always, please remember to follow me on Twitter, Facebook, and Instagram for new updates! Spring is already in full swing here in Japan. The Cherry Blossoms bloomed, their petals have already fallen, and summer is beginning to peak on the horizon as the temperature continues to rise by the day. I find myself inspired by music that has a seasonal feel, so today I wanted to write a post on my top 5 favorite songs of this Spring before the season changes! They are in no particular order, just how I feel like presenting them! Also, I am a big fan of J-pop, so all of these songs are Japanese songs. Though this is a sad love song about not being able to get over some one, the beat and the sound of the song is very Spring-like to me. I can listen to this song over and over again and feel myself walking through a row of Cherry Blossom trees. Even when its not spring I like listening to this song to make me feel like I am back in Cherry Blossom season. The music video is beautiful and every time I go to Karaoke I have to sing this song with the music video playing in the background. This song has a lot of the same sounds as Nishino Kana’s song above. I think it is the synthesizer that makes the beat of the song very spring-like to me. It’s a sad love song about a fleeting love, just like the short time a cherry blossom tree blooms for. I love the harmony and the chorus of “La, La, Love, Sakura”. Just like the above song too, I can just imagine walking through a row of cherry blossom trees and can feel the emotion of not being with someone anymore who you loved dearly. Another Tegomass song! Somehow I relate Tegomass with Spring recently and I think it’s because in 2013 they had Spring single releases and this year they had a Spring tour. This song is a song off of their new album “Tegomass no Seishun” . The title means “Spring Like” or the “Coming of Spring” and the lyrics are all about how everything is becoming like spring and the flowers are blooming. I love this song because its very upbeat and is a different type of spring song than is mentioned above, because it isn’t a love song. The final pick is also a Tegomass song. This was the B-side track from their “Neko Chuudoku” single and I had no idea it was the B-side until I heard them perform this song in the concert tour I went to. The Harmonica and the the country-like feel to this song really makes me feel like I am in the country side in America with a bunch of flowers around me. It’s a different feeling than the first few songs, because America and Japan have different perceptions of spring. Spring is about flowers blooming, but in Asia it’s specifically the Cherry blossoms and plum blossoms that it revolves around. In Americ,a its about flowers blooming in general and Easter. This song really makes me smile while I am listening to it walking somewhere recently, and I can really feel that spring is here! I hope you all enjoyed this post! Please comment below and tell me your favorite songs of this Spring and why! I look forward to hearing them!